Find hotel near Main Beach, Clarkes Beach .. The most iconic beach in Byron Bay and the one closes to the town centre is Main Beach it further extends to the east and becomes Clarkes Beach which in turn stretches round to form The Pass. The entire area boasts of pristine sand, ideal surf and the glorious sun. 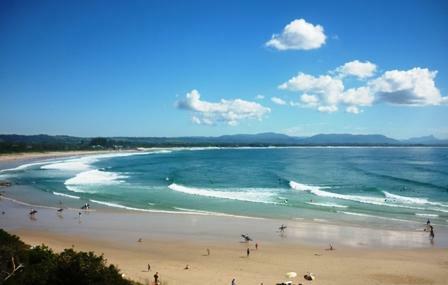 Main Beach is home to the historic Byron Bay Surf Club, which was founded in 1906. There are several quaint cafes that are located along the beach. In the summer months you might spot local Sandman, Steve Machell building gothic castles and other sand sculptures. From here you can snorkel out to the Tassie II, a wreck off the coast. The beach is patrolled is summer and is safe. How popular is Main Beach, Clarkes Beach And The Pass? People normally club together The Wreck and Wategos Beach And Little Wategos Beach while planning their visit to Main Beach, Clarkes Beach And The Pass.